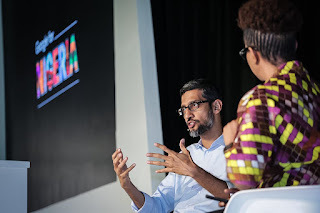 The ceo of Google, Sundar Pichai joined members of his executive team on his first visit to Nigeria as the company announced a series of products for the country, including YouTube Go, a platform where users with slow Internet can preview and save videos. The move is certain to increase YouTube's growing Nigeria base, which the platform is keen to court; it held the first YouTube sub-Saharan Africa awards last year and prominent Nigerian bloggers have been featured in advertising campaigns around the country. Google's charitable arm also made commitments to teaching digital skills. "I am really excited we are committing to train 10 million people over the next five years in Africa," said Pichai. "We ask nonprofits from around Africa to nominate the best ideas and we allow local people to vote for what they think is the best idea. Nongovernmental organizations nominate themselves and people get to vote and choose where the funding goes to," announced Pichai. Google grants arm will also train 100,000 African software gurus focusing mainly on Nigeria, Kenya and South Africa.